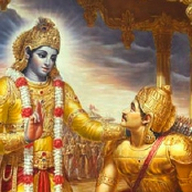 The Bhagavad Gita ranks as one of the most important works in the ancient Yogic traditions. It centers around a discussion between the warrior Arjuna and Lord Krishna who has taken the form of Arjuna's charioteer on the eve of a great battle. Venerable Marut takes us through Lord Krishna's sage advice on how to apply Yogic discipline to ones karma(action), wisdom(Jnyana), and devotion(bhakti).